Keeping the elements out of your home is important for lengthening the life of your home’s interior & furniture, as well as keeping you safe. Below are the ways in which we weatherproof your exterior frameless sliding glass doors for improved function and aesthetics. Interlocking Channels – By using translucent UV protected interlocking channels we are able to ensure a proper seal between panels to protect our system and your home from water and wind. Sealed Tracks – Prior to installing our track we wrap the opening with Protecto Wrap, which meets ASTM 2112, and use Sikaflex, the industry’s best sealant, to fill any remaining gaps. By doing this we are able to prevent water from escaping the track and destroying your floors. 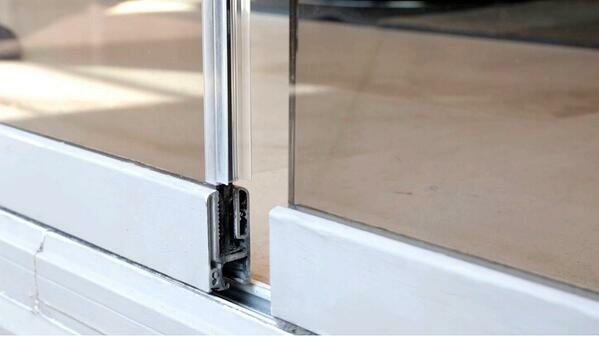 Our track sealing allows us to install doors in 45°, 90°, 120°, 150°, 160°, 170°, and the standard 180° angles. Track Drains – Depending on your exposure, we drill weep holes at the lowest point of the track to ensure any water that is collected from rain, pressure washing, etc. will drain out of the track. Ideally one weep hole is added to each panel, but this varies depending on the project. Learn more about our weatherproof glass windows. UV Protection - Weatherproofing is limited to foul weather days. The sun is capable of bleaching both furniture & floors. To combat sun bleaching a UV protective layer is added to all of our exterior sliding glass panels.